Aw….Just remember. Nobody loves you on any of the other days either. Hey- it’s a hard truth! But for those single ladies and gentlemen who still wish to involve themselves in the spirit of that sugar coated, teddy bear fluff of a holiday, we have the gifts for you. #3 Send a pile of sh*t.
What better way to confuse someone in the friend-zone or someone you just want to puzzle endlessly with your feelings. Cards can range from a sweet and simple ‘I hate you’ to well…..This. Perfect card for those special friends with benefits. That’s right, ladies and gentlemen, there is actually a service in this world that caters to delivering animal dung anonymously to whoever the client chooses. 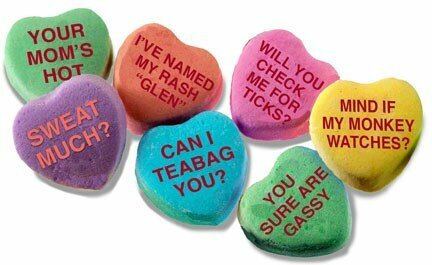 A favorite of jealous ex girlfriends on Valentines Day, choices range from an exotic elephant dung, to gorilla, and cow pats. Wouldn’t you LOVE to have their job? For the partner who feels its just about time to break up without doing the dirty deed. This G-string range is sure to send anyone for the hills. Had that special someone forsake you? Feeling pretty angry about it? Have no fear- voodoo will take care of them! Stick pins in all sorts of places while thinking of your ex beloved. A wonderfully healthy way to spend valentines alone. Perfect for the serial killer in you. So whatever your relationship status this year for Valentines Day – don’t forget that it doesn’t just have to be a time for cheesy love birds, and single people can have fun too!